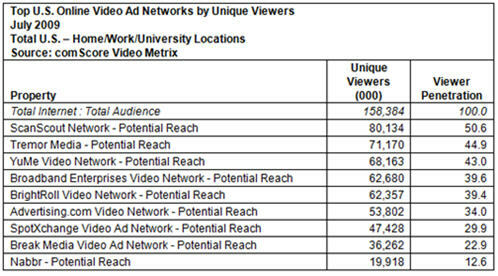 Below is a first look at comScore's rankings for video ad networks' "potential" reach for July '09. The rankings, which have not yet been publicly shared, reveal a relatively tight clustering of 5 video ad networks - ScanScout, Tremor Media, YuMe, Broadband Enterprises and BrightRoll - with ScanScout capturing the number 1 spot in its first month being fully measured by comScore. The "potential reach" aspect of these rankings is important to understand. As I explained in June in "Unraveling comScore's Monthly Viewership Data for Online Video Ad Networks," the potential reach numbers account for the aggregate number of viewers of all the sites that the ad network has the right to place ads on. However, as I discussed with Tania Yuki, comScore's director of product management, it's not a perfect measure, though comScore is continually trying to improve it. The rankings are determined through a combination of the ad networks' self-reported publisher list and comScore's own tracking. If a video network reports that any one publisher accounts for 2% or more of its viewers, comScore requires a letter proving the business relationship. There is also a self-policing mechanism as comScore provides a "dictionary" of all publishers that each ad network reports. Competitors can review the dictionary and appeal to comScore if something appears amiss. Still, there's some looseness in the methodology, and having spoken to a number of industry executives, also a fair amount of concern that it is accurately portraying the industry's true performance. comScore recognizes the limitations of the potential reach approach and that it is just one way of understanding a video ad network's value. Actual monthly performance is equally important, and comScore has been working with ad networks to implement this reporting as well. As I wrote in June, the "hybrid" approach requires ad networks to insert a 1x1 beacon in their video players. Though this approach also has its limitations, many of the biggest video ad networks are now implementing the beacon, and soon comScore will likely begin reporting actual as well as potential reach. Video ad networks are a very important part of the online video ecosystem, responsible for placing millions of dollars of ads each month. Importantly they allow a level of targeting and reach that brands seek, but are often unable to attain on their own with a handful of direct site relationships. With the online video medium still relatively new, buyers require data helping them understand their options. However, the comScore data is just a first filter, diligent buyers still must dig in to understand how each network, or individual site meets their needs.